Greetings and salutations, everyone; yes, once again it is I, your popular host, Mani the purebred border collie, Frightener of Hawks, Stalker of Coyotes, and Growler at Owls. You may remember me from such posts as “Nothing Again Nothing”, among so many, many others. The guy I live with fiddled with the ISO and other such things on the point-and-shoot, and the picture above is what he got. Not what he wanted, but whatever. It’s still me, as you can see. 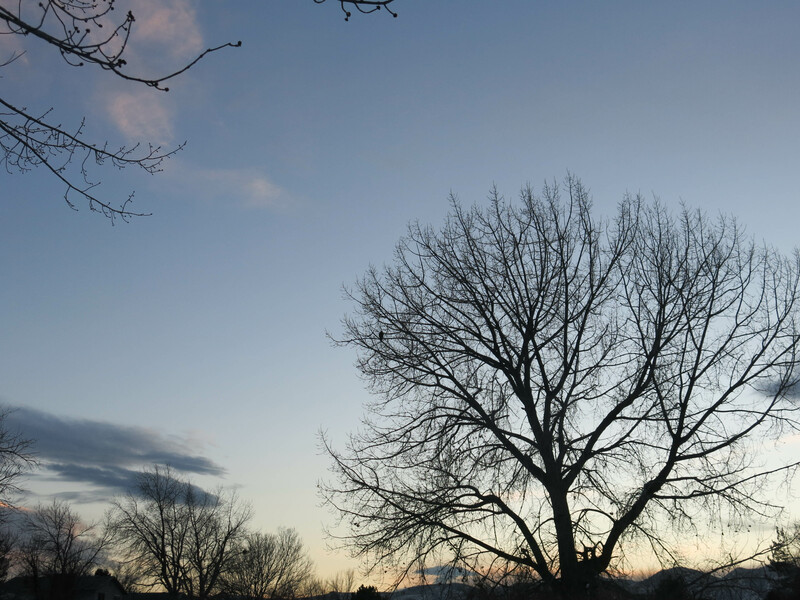 There was blue sky the other day. 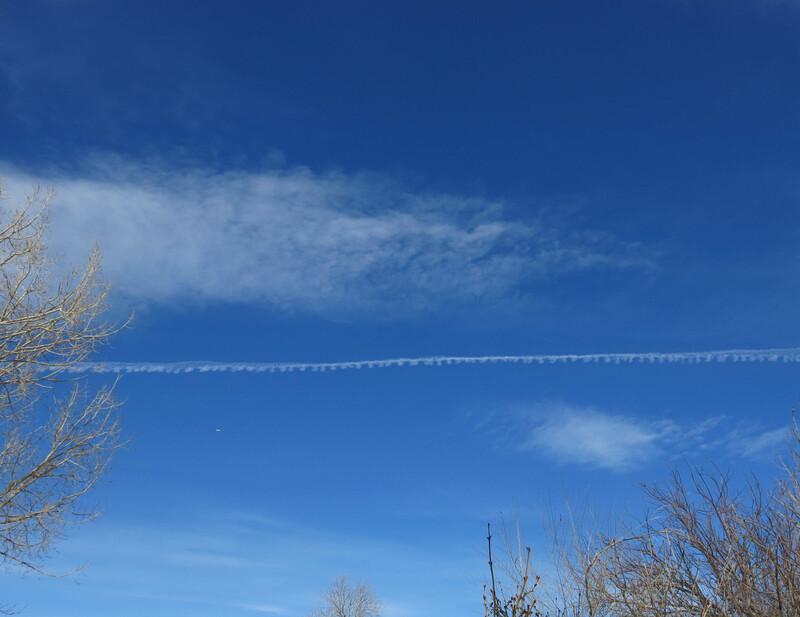 And this contrail. The guy I live with said the plane was probably headed to San Francisco. The spiral pattern was sort of interesting, but the blue sky was extremely interesting. It got gloomier. The guy I live with constantly complains about how gloomy the weather is, and I guess because it is often very gloomy here. He said some wind might be nice, but that’s become so rare that when it happens there’s a movie featuring it. Mostly the air doesn’t move. Denver used to be a windy place. And now the gloom, according to him anyway, is practically perpetual. I have some pictures, which are on the same subjects that I’ve posted on before, but they’re different. 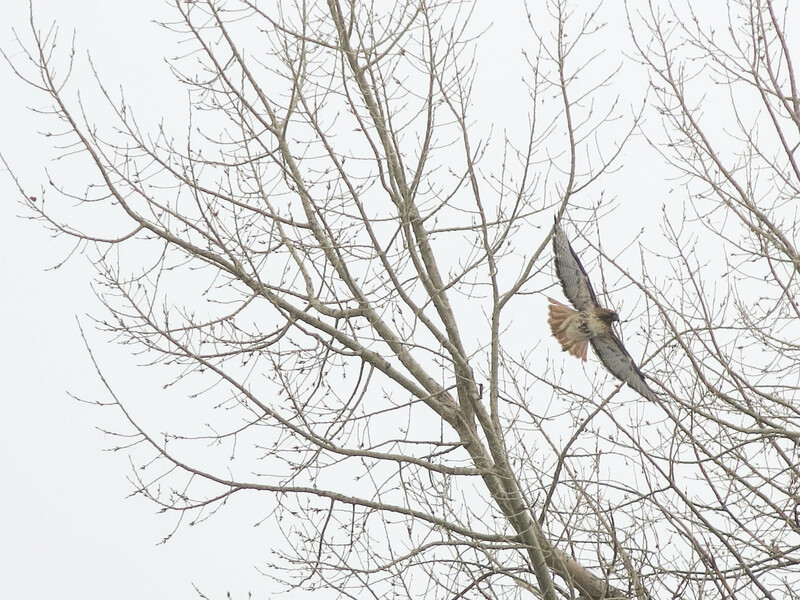 I saw a hawk on one of the gloomy days, but also when there was blue sky, and those pictures are better. You might have to really squint to see it, but I didn’t have to, what with my totally superior eyesight. I, being viciously fierce and deadly, scared away the hawk with my very presence in the field. That day when we had sun, another creature ran through the field. 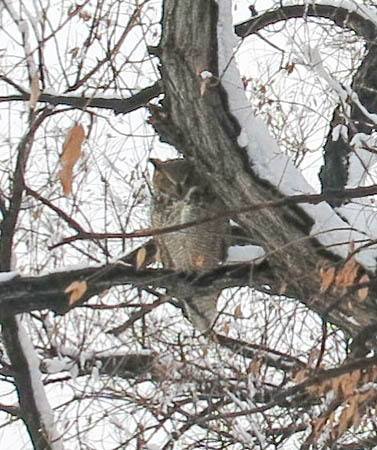 Maybe you can see that it was limping a little on its right hind leg. The guy I live with said that while coyotes can run free, they don’t get taken to the doctor if something is wrong. They also don’t get to hog the bed at night. 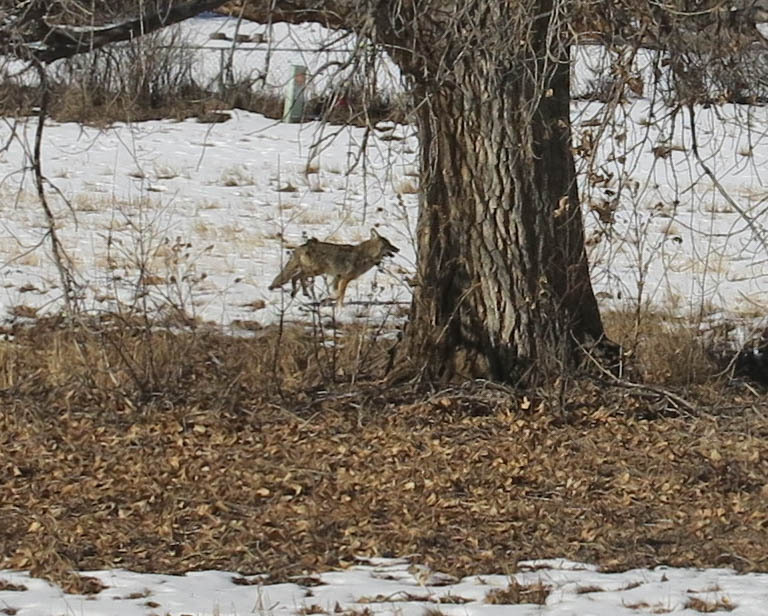 I’ve been seeing probably the same coyote every day now, on my morning walk, and a couple of times it’s trotted out almost right in front of me, and I really wanted to go after it, but the guy I live with said he couldn’t walk that fast, so I had to be content with sniffing. Some more major–to him, at least–things have happened. The first one was that he had the “procedure”, which was placement of fiducial markers in his prostate as a target for the radiation, which will start in about a month. The markers are gold, so I guess he’s worth more than he was a week ago. He said it didn’t hurt–much–and didn’t take very long at all. He saw the ultrasound image showing the gold markers, and thought a copy of that would be nice, but I knew what he would do with it. Make me post it on the blog. He’s not squeamish at all, but some people are, and there would have to be warnings. His friend took him to the urology center because he couldn’t drive home, what with all the drugs he got, and she said when they stopped off at the store he told everyone he was on drugs. She just rolled her eyes. He said it was easy to see why people get addicted to opiates, but he only got one of each pill so that was that. He felt awful when the drugs wore off. He’s a lot more indifferent to all of this than you might think. He said that compared to having to face the rest of his life without his wife, this wasn’t much of anything. There will be a lot of days when he has to leave the house, but not for long each day. Even more major, though, was what happened today. He sold his mom’s house. He was really anxious to get this over with, and he was pretty relieved, but when he called USAA to have the homeowner’s insurance policy stopped, the super-nice person on the phone (and everybody there is super nice) said something about getting a check for being a subscriber for sixty-nine years. The guy I live with’s father got the policy after he graduated from West Point in 1950. So his parents, and the house they moved into in 1961, will begin to fade into the distance. The thing is, though, like he was telling his friend, he can still hear his wife’s voice, her laugh, her touch, and so forth, and so in a way she is still alive in his memory. That’s kind of weird. He sometimes wonders if that would be a comfort to her. I bet by now you’re exhausted from all this philosophizing and talk about gold implants and stuff, and can hardly wait to see pictures of snowdrops. It snowed today, so there’s nothing going on in the garden, of course, and the guy I live with said we would probably have snow until May, when it will start to hail. You may well imagine that I have to listen to things like this all day long, every day, and indeed I do. The long stretches of temperatures in the sixties, even seventies, in January or February, with snowdrops in flower “back in the old days”, have given way to this endless, dreadful winter weather, with frozen soil, and snow that won’t melt. 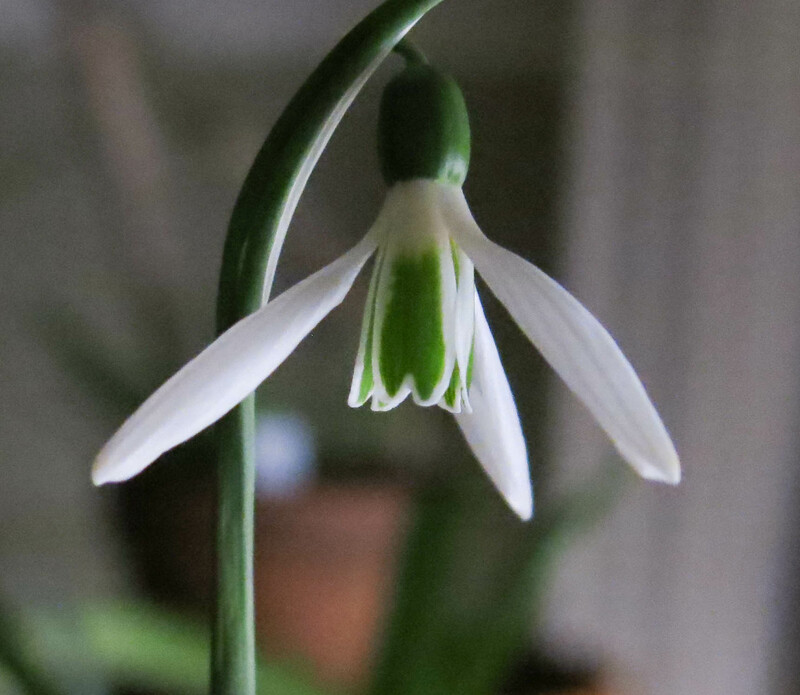 So indoor snowdrops will have to do. Some of the pictures are better than others. Still with me? Okay, now back to outdoor things. 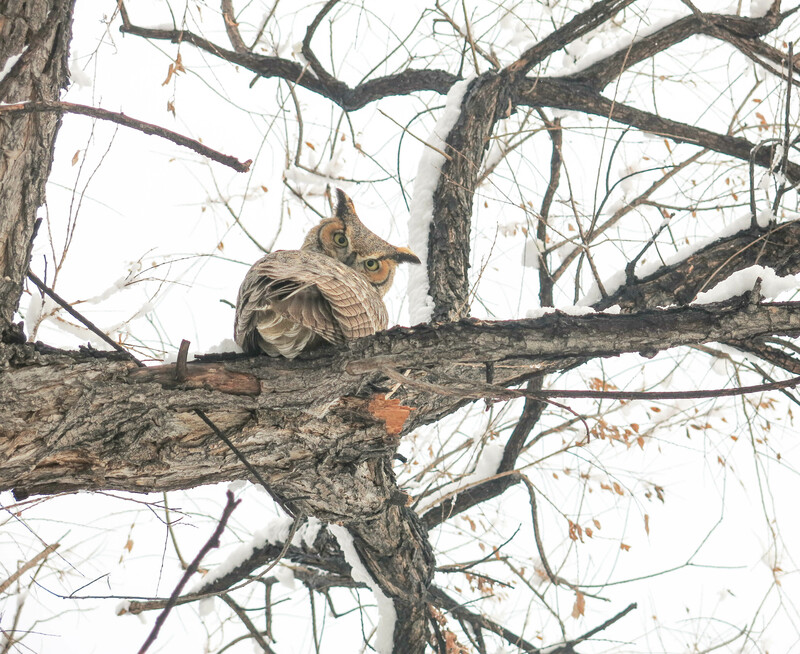 Some cool owl pictures might make up for the snowdrop talk. 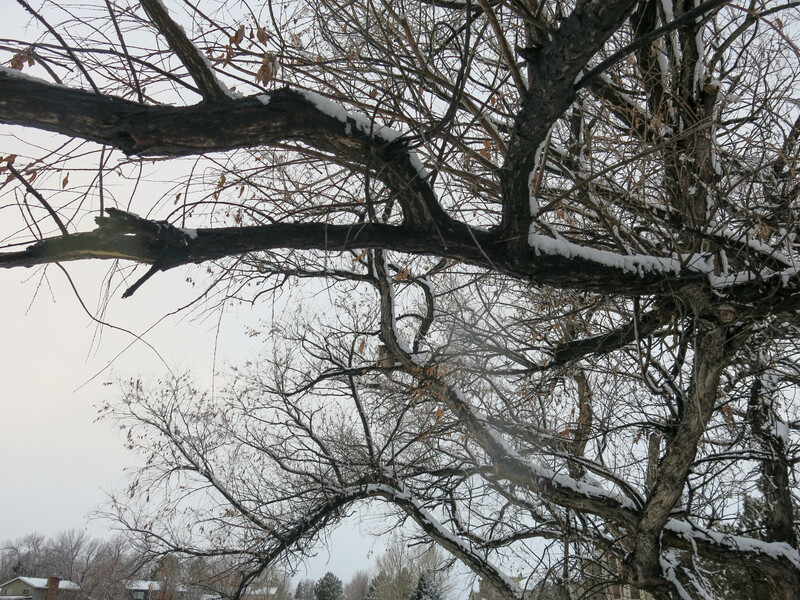 My evening walk was snowier than usual. I had to ignore all the complaining at the other end of the leash. We walked under the willow, like we always do, and then when we came back, there was someone sleeping in the willow. (Almost in the center of the picture.) But it woke up when I got close. It looked pretty annoyed that it was awakened before it was ready. I felt like an alarm clock on legs. You can see how annoyed it looked when we were on the other side of the willow. Maybe this was slightly scary. Just slightly. The owl looked pretty mad, don’t you think? We weren’t making a lot of noise (I might have growled a little), though the guy I live with was probably talking. He usually is. So that was the last few days. I hope you were able to follow all of this. It wasn’t as linear as I hoped it would be. Please share our concerns with your owner and give him extra cuddles and plenty of reasons to chuckle in the upcoming days. Thanks. He’s actually doing okay. No horseback or motorcycle riding for a while, though. Which is good, since he doesn’t do either one. So look at all the effort he’s saved. Thanks. Except for the complaining about the weather, things are not terrible here. Though if we don’t get to see the eclipse, because of clouds, I’m sure I’ll hear something about that, too. Thanks. There were little bits of gold jammed into the guy I live with, but he was on drugs. It wasn’t too bad at all. 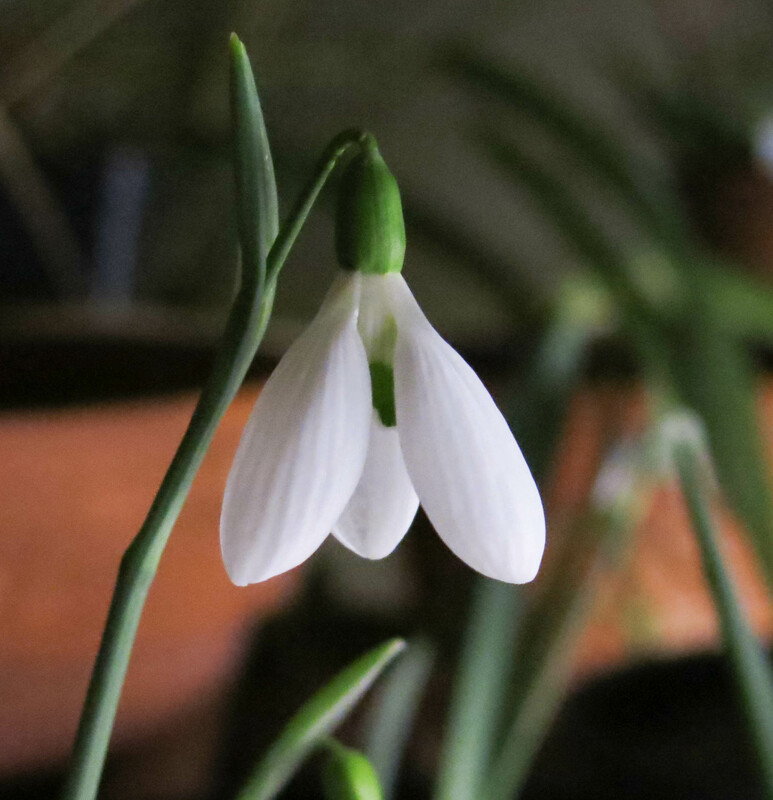 Love the snowdrop pictures as well as those of the owl. Thanks! Was the owl mad? Or is that more a look of loathing? Some of this post made me sad, but not the parts with the owl and the snowdrops. Well, some say that without the sadness we wouldn’t appreciate the good stuff, but I don’t think so. And anyway, some of us get too many lessons in appreciation. How about you Mani? Are you going to appreciate the vet more because you’ve seen a fellow creature limp? 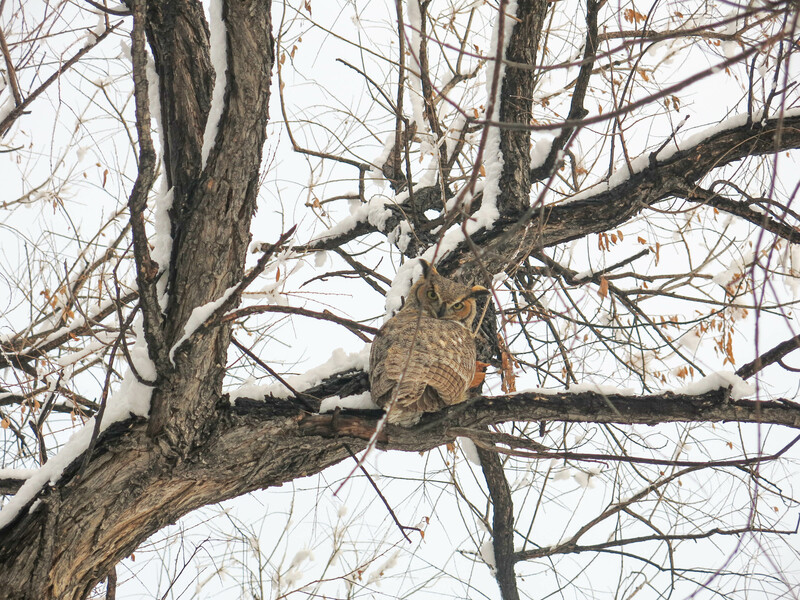 I think the owl was angry because it was sleeping. The guy I live with said there should’ve been a “Day Sleeper” sign to let us know. I do appreciate having a doctor, especially because I have Day Care at the same place, and that’s a lot of fun. The guy I live with says that, really, things usually aren’t good or bad, they just are. I find this hard to figure out. As for him, well, imagine what might have been had he not had his annual physical. And his mom, things were not easy for her after his dad was wounded, for sure, but for the last ten years of her life she lived in her house, like she wanted to, and her children and grandchildren (and great-grandchildren) all lived pretty close to her. Actually . . . I do not find snowdrops to be interesting. I just go along with it because everyone will be writing about them pretty soon. They are pretty, but I do not understand the cult following. I think the owl is more interesting, and scary . . . and creepy and such. Mewo meow Mani yore bloggie was supurr fun to reed….Well wee worried ’bout yore PawPaw an his markerss an sure hope hee will get better from THE procduress…it not sound comfertaabill at all. An Mee can tell you Hu’manss have a lot of papurr werrk to do fore each other…wee 4 leggedss onlee need papurr to play with or pee on rite??? THE Hawk iss purrty kewl an THE Owl iss amaIn!!! Mee not think hee was reelly mad; they are furry seereuss birds. Mee used to mee-ow to them when mee was an outside cat. Hawkss sorta scared mee as they wuud swoop down close! 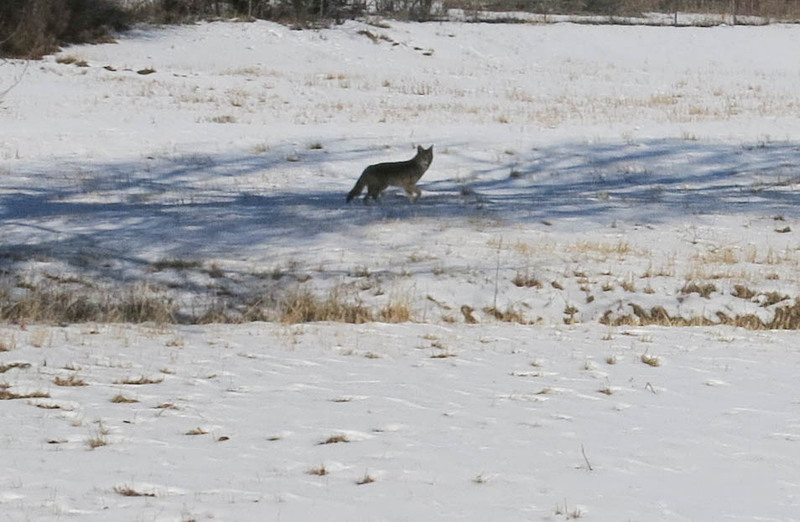 An yore furry brave ’bout Coyote…..they eat catss like mee upss here!!!!! EEEKKK!!! 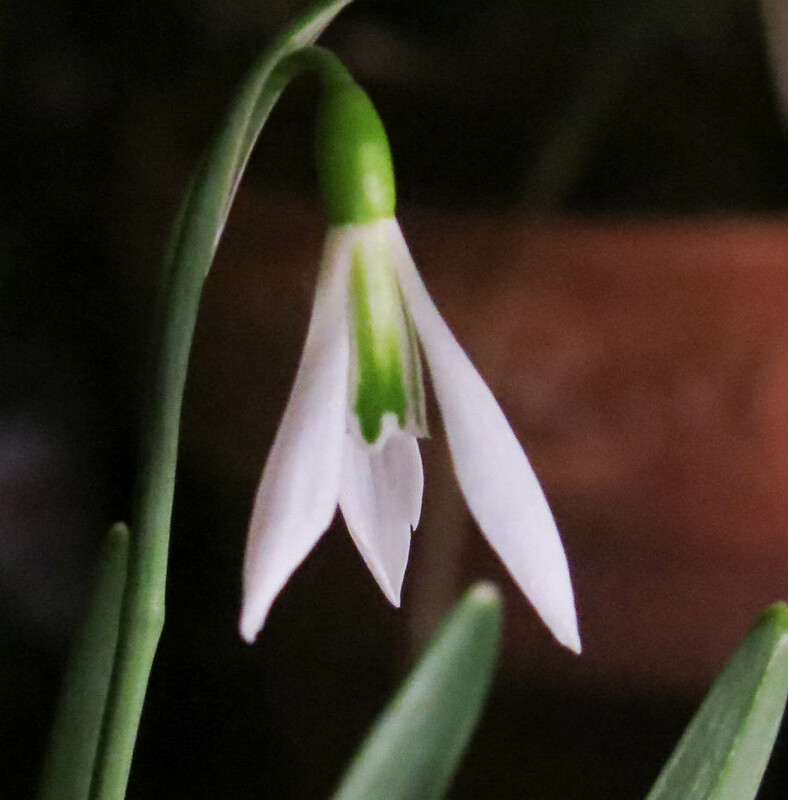 Iss snowin an FURRY cold here…mee missess guud weather….yore Snowdropss are so cheery! Thanks. The guy I live with likes cats, a lot, which I fond hard to accept, but he does. Cats have to stay indoors here, because of what you said, and we’re not going to go into that. The markers are “targets” for the radiation which will begin in a month. He said he would only be gone for an hour a day, unless there’s traffic or a storm. Mee understandss ’bout ‘targetss’ an will purry to Sky Cat fore yore PawPaw to bee healed with THEE raydiation! An an hour a day iss not too long…you can have a cat nap….ummm no maybe a dog nap while hee iss gone, mew mew mew…. 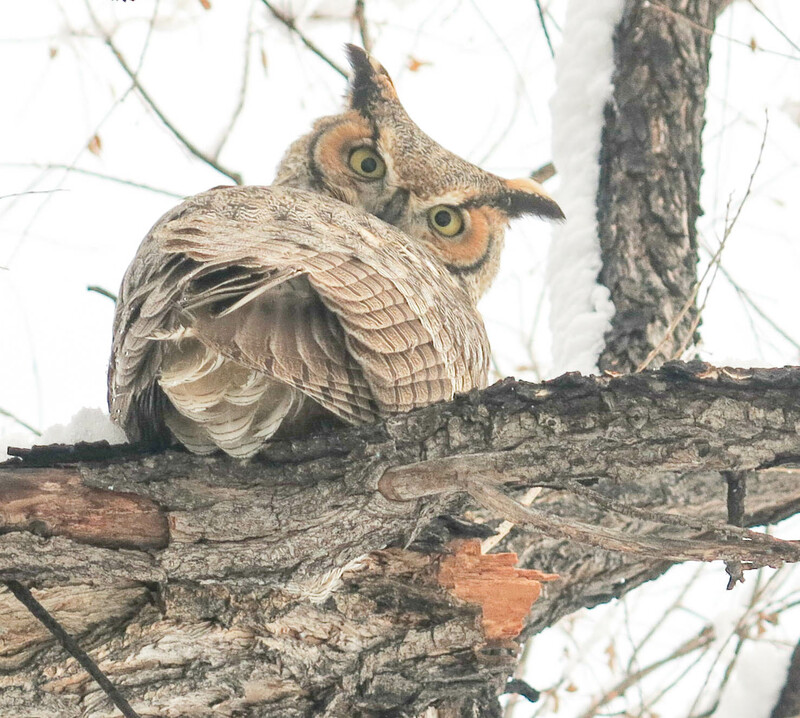 The sequence of owl photos made me laugh and laugh; thank you both. That is one ticked-off bird. Thanks, and you’re welcome. The owl did seem really angry. We try to be quiet when they’re sleeping, but sometimes things happen. 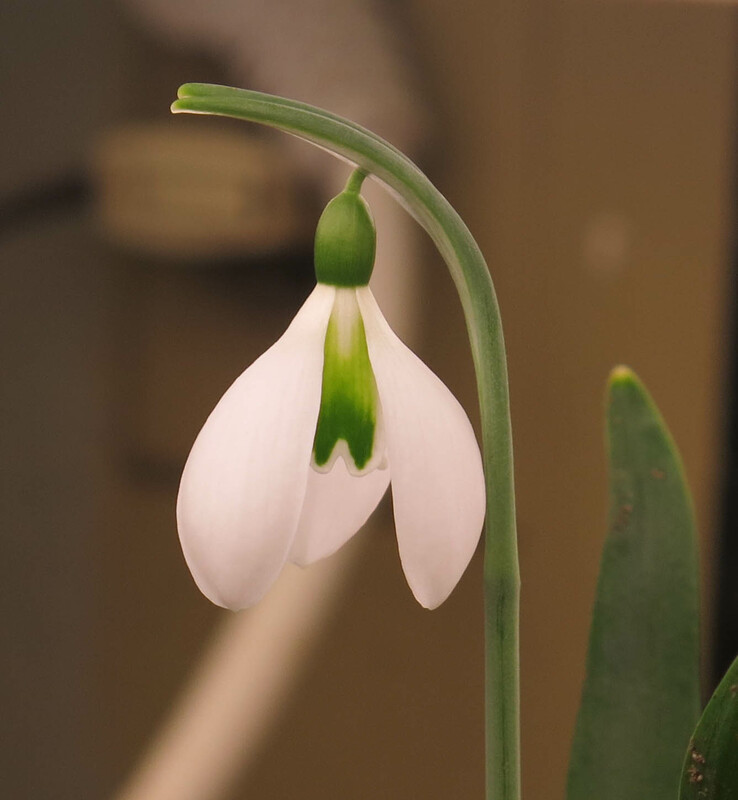 Maybe indoor snow drops are actually easier to fully appreciate – no lying on one’s belly in the cold? Well, the only thing outside now is snow. The guy I live with said he fell flat on his face in the snow many times, when he worked outside, but hopefully those days are over. 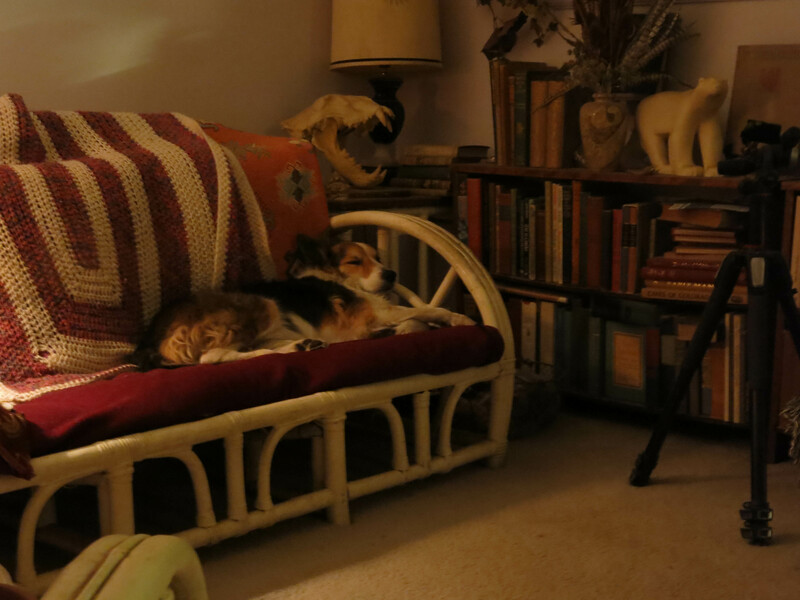 Ms. Edna is the first poet I read; and, really, not that far from the late Mary Oliver. Love them both. In other news: My husband came through the door at 11:30 last night, having flown across country into the squalling face of a storm. He’s impressed with Detroit Airport’s snow-removal system. I gather, Mani, the guy you live with is the snow remover in your neighborhood. What is happening to me? I’m in the throes of liking snowdrop closeups. 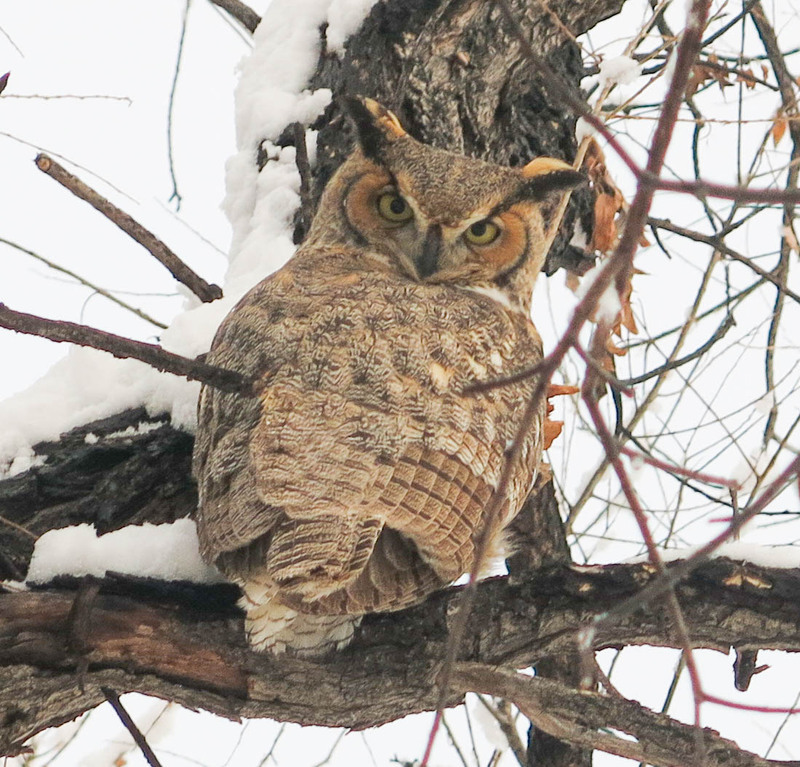 Also portraits of seriously pissed-off owls. So comic, although the bird looks as if he/she could scratch out my eyes at the very thought. Have you told your guy yet he’s worth his weight in gold? Better hurry lest someone beats you to it. Thanks; I think he knows how I feel about him. He did shovel all those walks but not the last time it snowed. 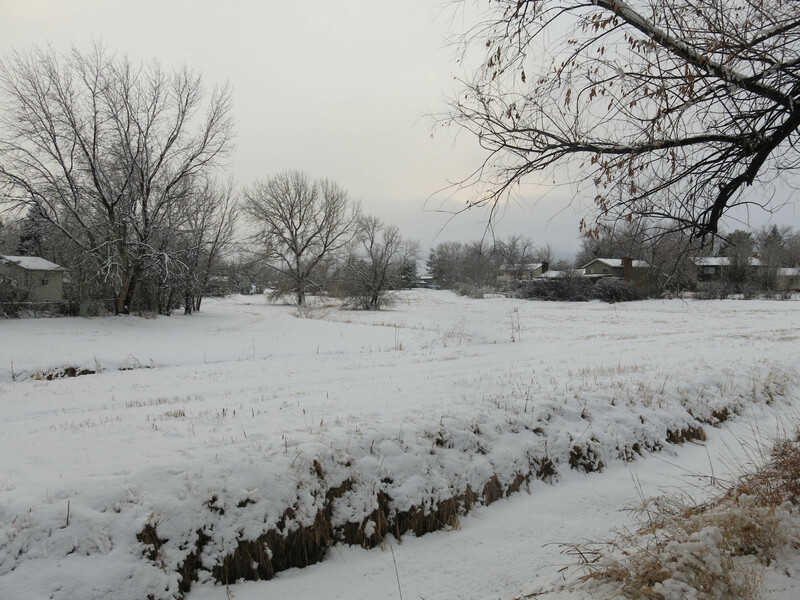 The guy I live with said that some years ago a Denver mayor lost a bid for re-election because opponents said there was too much reliance on the “solar method” of snow removal. A lot to be said for our hot winter sun. I had a client who has that gold thing done (for the same reason). I say had only because he and his wife moved away; he is still doing fine many years later. I’m catching up on your story…I always think if I had to have radiation or something like that, I would really especially resent having to leave home to get it done. Worse here because I’d have to go to a hospital an hour and forty five minutes away. Anyway. Hoping the procedures are over soon and life can get back into full home and garden mode. Thanks. The guy I live with told me that he would only be gone for about an hour every day; maybe a little longer because of rush hour but he discovered a way to get there that’s pretty pleasant. Meanwhile he says he’s going to start painting the inside of the house again. Or finish what was started.